The IPCC predicted less snow and cold. Autumn snow extent for the entire Northern Hemisphere has also been increasing, and set an all-time record last year. As always, the experts are clueless hacks, and have absolutely no idea what they are talking about. And you have again misquoted someone, David Viner in this case, to support your false claims. If you would include everything Viner said, you would see that you have misquoted him, but I doubt you even read the interview your cherry-picked quote comes from. In any case, the link above explains why your implied claim is false, and it contains links to the scientific papers it refers to. You are correct, no one season proves or disproves global warming. 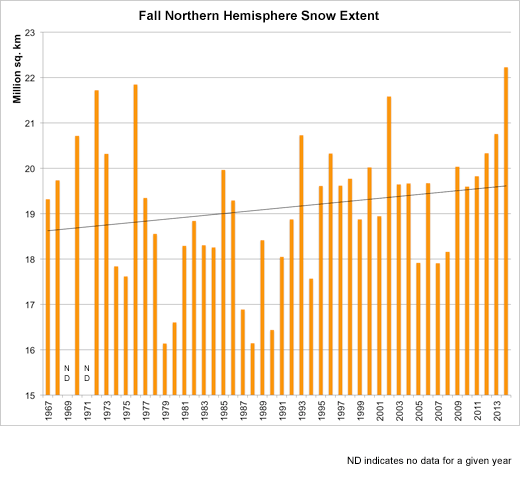 But when you see such a clear trend of increasing autumn snowfall over nearly 50 years, it does create a reasonable doubt concerning alarmist’s claims of dangerous, catastrophic warming, when the trend for more snow outside of winter clearly shows just the opposite. You had better believe that if the trend was opposite, the alarmists would be shouting it from the rooftops, about the need for immediate, radical action to fight global warming. The trend is the opposite, for the northern hemisphere, and yes, we are shouting it from the rooftops. The northern hemisphere, Steven, I am talking about the northern hemisphere. Martin the Gore bot is making a total embarrassment of himself. Refuses to accept REAL DATA when its right in front of him. He’s probably the dumbest most ignorant troll we have ever seen..
…. and that’s saying something. Actually RAH, I think Martin the Troll comes in second place. Hope for Brains still hold first. Martin says: “snowfall does not disprove global warming”. I have answered your question elsewhere in this discussion. More than once. The short answer is yes, but given what you wrote, the nature of the task is clearly beyond your understanding. You mean beyond your capability to explain it rationally! They sure had the hose on maximum when they brain-washed you. Took all the grey matter with it. Left behind a fetid oozing mush. You are the stupidest, most ignorant troll that has ever graced these hallowed walls of reality. Perhaps Martin can find that one illusive paper that actually proves empirically that CO2 causes warming in an open atmosphere. AGW is a hypothesis.. Martin need to find proof of that hypothesis. Lack of snow wouldn’t prove global warming either, but you should take that up with David :the loser” Viner. Where does SG say that it does. Man you are paranoid !!! We all know that there is NOTHING that can disprove an unproven hypothesis that morphs to cover everything that can happen…. …. even if nothing is happening. Nothing untoward or unprecedented has happened to the climate over the last 10,000 or years. The natural ups and down continue. We are in fact, only just a small bump above the coldest period in those last 10,000 years. The next climate disruption will be at the end of the current interglacial… hopefully still a fair time away. But we know you will NEVER let facts get in the way of another meaningless empty rant, will you little Gore bot. And again the reliance on the cartoonist site.. so funny. Martin, we already KNOW you are ignorant, no need to keep rubbing it in. ! You have misquoted David Viner. Then what is the correct quote? Maybe we’ll never know, since the site has been scrubbed lol. Oh the embarrassment. Here’s the money quote from the original article in the Independent. Now what were you saying Martin? A bit off topic but an interesting find though difficult to read.. …..Overall, MIS 5 was mostly mild with warmest or peak interglacial conditions at the very start during MIS 5e. MIS 4–2 was mostly cold with most extreme or peak glacial conditions in the closing phase during MIS 2. This points to a subdivision of the last climate cycle into an early, overall mild interglacial half and a late, overall cold glacial half, each with duration of ca 50 ka. This review also shows that the climate variability in central and northern Europe during the LI–G cycle was mostly in degrees of continentality with major shifts in winter temperature and precipitation values; summer temperatures, on the other hand, remained largely unchanged.…..
For reference from another paper “The Eemian sea-level highstand” [aka warmest or peak interglacial conditions at the very start during MIS 5e] and “persisted from ca 130 until 124 ka BP in the eastern Baltic.” The Holocene is 11,718 years old or it started ~12 ka BP. So this paper seems to be looking at the weather during the Eemain and Wisconsin Ice Age in Europe. “… the climate variability in central and northern Europe during the LI–G cycle [Last Interglacial–Glacial cycle] was mostly in degrees of continentality with major shifts in winter temperature and precipitation values; summer temperatures, on the other hand, remained largely unchanged…. The reference to ‘precipitation’ MIS 4–2 (ca 70–15 ka BP) would be the time during the Wisconsin Ice Age leading up to the Holocene. …The time interval encompassing MIS 4–2 shows open vegetation. It is characterized by two glacial maxima (MIS 4 and 2) with sub-continental scale glaciation over northern Europe and dry conditions in strongly continental eastern European settings…. No, he has done nothing of the sort. Why do you keep lying, is it pathological? Have you considered seeking psychiatric help – urgently? Now look at the REAL DATA, Martin. something you seem to have a really big issue with. And that statement is correct. Heavy winter snowstorms will decrease. RIGHTTttttt that is certainly why Italy broke the 24 consecutive hour total accumulation World Snowfall Record not once but TWICE last winter and the Greek islands in the Mediterranean got buried under 6½ ft (2 m) of snow. Martin has certainly not been paying attention. Viners comment was in 2000. Just looking at the last five years since the start of Solar cycle 24. South America and even the USA has been having the problem of livestock freezing to death in Martin’s nonexistent storms. February 2010 Scotland has suffered some of the coldest winter months in almost 100 years, the Met Office has confirmed. AccuWeather Inc. is on record as saying this could be the coldest winter in 25 years in the United States. Coldest winter for 200 years! As the rest here know I have similiar info on more recent winters. Record snow in Abruzzo, Italy (elevation 36 ft) for about 24 consecutive hours it snowed persistently recording a total accumulation of 1 meter and a half. 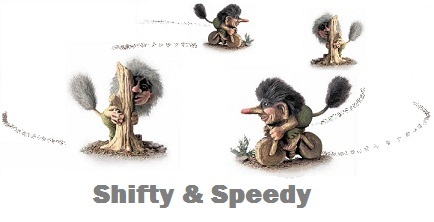 Of course Martin the Troll knows storms are increasing because I just pointed that outYESTERDAY! Martin WHY would I believe a site by a CARTOONIST who calls us DENIERS and tries to show we are crazy? Great post Gail! I’ve learnt so much from your posts and especially your links to articles, papers and web pages. Thanks and do continue doing what you do. Here’s some more of that “decrease” Martin was talking about. That’s an entire paragraph, uncut. If you believe that’s cherry picking, your complaint is with the cartoonist who wrote it, not me. The subject is plainly the VOLUME of snowfall. Tony’s comments are about the EXTENT of snowfall. Greater extent means greater area near or below freezing. Your own source plainly states that snowfall extent should DECREASE, not increase. Why do you insist on making a total fool of yourself? The really odd thing is that he thinks he is proving things by linking to SkS. Its some dumb and juvenile and anti-science that I can’t believe Martin actually functions as an adult. So far he has yet to make a coherent case for ANYTHING he has said. 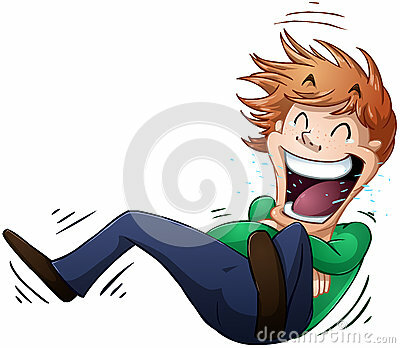 For someone who claims to be a “technical writer”, you have the comprehension skills of a 2 year old. No worries though as he will have plenty of time each winter to brush up on his skills when he is snowed in. You just can’t make people see what they refuse to see nor understand what they refuse to understand with words and graphs, and data alone. If he’s lucky, one day perhaps Martin will have an epiphany and look back and be amazed and embarrassed by how blinded he was. Winter snow, be it from heavy storms and/or flurries, has all has increased in Eurasia Martin and that is counter to what the IPCC predicted. And according to most of the weather models, Western Europe and the British Isles are in for a very big winter. And British Children, even those in the lowlands and coastal areas in the south, already know what snow is because they’ve seen it first hand. Is there ANYTHING you people claim will disprove global-warming/Anthropological Climate Change? I’ve about come to the conclusion that if glaciers were creeping down the great lakes or Niagra Falls were frozen for 10 months out of a year you people would still be saying it was caused by or does not disprove “global warming”. And no, your explanation does not address the FACT presented by Steve concerning the IPCC claim about heavy snow which has been proven false. possible influences of anthropogenic aerosols. relation (Muller et al., 2011; Singleton and Toumi, 2012). but warming reduces the fraction of precipitation that falls as snow. region are projected to increase (Sun et al., 2010). RCP8.5: –6.0% ± 2.0% (24 models). Yes, rah. Of course. Publish a paper showing a natural cause or a set of natural causes that explain all the data as well as AGW. I assumed your question wasn’t serious, rah, because the way to disprove science is with science, so the way to disprove AGW should be obvious to all of you. Apparently it isn’t. Now that I think more about this, of course you guys don’t know how to disprove AGW. That is why you are still trying to prove that data adjustments are incorrect by showing pairs of graphs that show data have been adjusted. Rah, in their own words: the reason they started calling their issue “climate change” is because they one day ‘realized’ that a supposed increase in “freakish” weather, TO INCLUDE abnormally cold weather, is caused by the assumed Global Warming. So you don’t have to wonder. They’ve already effectively admitted to the position that you’re wondering about (where you say “I’ve about come to the conclusion”). That’s the intellectual level that Martin Smith is operating at. He and his ilk have already concluded that the climate you describe, if it happened, would INDEED be caused by global warming! Here’s how bad it is in their brain right now: they are already committed to the position that they’ll still believe the globe is warming, even if we get to the point that every station in the GHCN has to have its trend “adjusted” by 5°C in order to “show” any warming! For a picture of how bad that is, consider this: if the mean temperature of Western Europe dropped by 5.5°C, that is 9.9°F. That could correspond to a decrease in the mean winter temperature, for that region, of more than 20°F. We could have icebergs off the coast of Miami Beach if that happened! And we’d be having multiple, huge snowstorms across central Florida every winter, with massive snowdrifts. Our climate would be similar to Buffalo’s today, with “Gulf effect” snow dumping across the western half of the peninsula when a major cold front came through. This is what the Martin Smiths have ALREADY IMPLIED would be caused by global warming, if it happened. They committed to this farcical concept the day that they decided the problem was any kind of “climate change”. BTW, as I write this, the sun has just risen about 20 minutes ago and we’re having a morning low of 58°F outside my house, at latitude 28°N. Take note, Martin Smith, that is an ACTUAL measured temperature (= datum! ), not something that the National Weather Service produces for their schoolmarms in the White House! Richard, this is how you disprove AGW: Publish a paper showing a natural cause or a set of natural causes that explain all the data as well as AGW. Thank you for making it abundantly clear there are absolutely no specific indications which your aware of that will disprove the hypothesis of AGW/climate change. That’s all I needed to know. Papers upon papers before and after this AGW scam began have pointed to the fact that what had to be natural forcings which caused climate changes in the past which far exceeding anything that has ever happened in our life times. And the fact that there is massive evidence that not a single thing that is happening in the climate today has not happened in the past before the industrial age. And that CO2 rise in the past has followed increased temperatures and not preceded them. Global Sea Ice remains within 1 standard deviation of the satellite mean after having set multiple records. Antarctic sea ice remains above the satellite mean after having set multiple records. Arctic sea ice, growing at a record rate right now, is at about the same level it was in 2014 for this day and well above the 2011,12,and 12 levels for this day and is about 1 standard deviation below the satellite era mean. All exactly counter to what the IPCC 5th report claimed with “high confidence” would happen, but you deny or at least fail to note that reality or the reality that over 95% of the climate models the IPCC has based it’s projections upon stink to high heaven. rah, all of those papers you refer to about past climate changes being larger than the current warming are (a) about changes with known causes that are also known not to be causing the current warming, and (b) about changes that occurred over many thousands of years, even tens and hundreds of thousands of years, while the current AGW explained warming has occurred over 100+ years. I answered your question, rah. This is how you disprove AGW: Publish a paper showing a natural cause or a set of natural causes that explain all the data as well as AGW. I should also have included that you can publish a paper that disproves the greenhouse theory, and there are other things you can disprove that would disprove AGW, but no one has done that yet. Some have tried claiming it is the sun; some have tried claiming it is cosmic rays; some have tried claiming it is natural cycles. None of these has stood the test of scrutiny. No you did not answer the question and it clear for all to see that have better comprehension abilities than you, that is the case. That’s ridiculous. What “known causes” force climate models to run hot? That is false, Richard. The terms climate change and global warming both came into use long ago. What I was suggesting was that the definition of “climate change” has shifted in how it is commonly used. You almost certainly know this to be true. The definition has not shifted in how it is used. Or maybe I have misunderstood what you wrote. How has the use of climate change changed? Sorry, I don’t have time to deal with your nonsense right now. Sure the attempt has been made to change it. Where before the scam began “climate change” was used to describe changes resulting from natural causes, the alarmists adopted it to refer to changes they claim are caused by the activities of humans. They used to like to use the abbreviation AGW but refused to create the abbreviation ACC because they want lay people to believe that all changes in the climate are the result of human activity. Climate change” means a change of climate which is attributed directly or indirectly to human activity that alters the composition of the global atmosphere and which is in addition to natural climate variability observed over comparable time periods. CLASSIC PROGRESSIVE manipulation of changing the meaning of a word. So people have been hoodwinked thoroughly. Of course that’s the idea. They can make all sorts of horrendous claims about “climate change” (assuming their definition), which people will assume to apply to, not “climate change”, but to a change of climate (meaning any change, whatever the cause or mechanism). So if they say, “climate change” is 1000 times more than it was 100 years ago, that may be true, but it might still be that the change of climate is negligible. Do you see now how the hoax is perpetrated? They have no friggin idea of what the climate is going to do. Grinnell Glacier: changes in Grinnell Glacier, 1918-2006 [Credit: 1938-T.J. Hileman/Glacier National Park Archives, 1981 – Carl Key/USGS, 1998 – Dan Fagre/USGS, 2006 – Karen Holzer/USGS]periodic modification of Earth’s climate brought about as a result of changes in the atmosphere as well as interactions between the atmosphere and various other geologic, chemical, biological, and geographic factors within the Earth system. Which conflicts with the IPCC “definition”. Terminology is important to Science. The IPCC goal of changing the “Climate Change” definition is to obfuscate. When I hear our fearless leader say something like “we must stop climate change!”, I know he’s either an idiot or a liar. Rah, of course they refuse to understand. They also have made so many claimed thing caused by global warming, now climate change, trolls like Marty can write anything. Do not know if you have seen a listing done by Dr. John Brignell at Number Watch, but it is classic. Footnote (September 2015) Why the list stopped growing. The time it takes to process a new entry increases approximately with the square of the list length, after checking for duplications, spoofs etc. Starting it was based on the naïve assumption that the rate of appearances would decline as opposing evidence accumulated, but the reverse happened. That’s the difference between science and religion. It was taking over my life, which I did not want to end as a garbage collector. There have since been hundreds more claims of an increasingly ludicrous nature. When quoting from the IPCC, please use the most recent version. Thanks again, Steven, for another chance to correct some errors. Can’t wait to see what your big story is about. The zombies are already attacking. Later. The one with 95% probability and broader climate sensibility You know. So the IPCC 100 year predictions are out of date in 15 years? Thanks for clearing that up. If IPCC report #3 is garbage and should be disregarded why should anyone have faith in their more recent garbage? When it doesn’t pan out you’ll be calling for us to disregard it several years from now. I am confused, Martin. More snow means global warming? You might think it all makes sense but people laugh out loud when I bring it up. That has been done and more than once. What happens? The attack dogs are set loose on the scientist. The Climate Inquisition in action! Salby’s trip to Europe was to present and discuss exactly this point…. So what happened? Acadamia had a trial in absentia and fired Salby stranding him in Europe! And before that there was Dr. Z Jaworowski. He completely shot down the FRAUD about CO2 being very low for millions of years and showed the ice cores as now analyzed gave erroneously low values. Again he too was fired and had funding refused. The latest of course was Willie Soon. His newest paper published this spring in Nature Geoscience entitled ‘Dynamics of the intertropical convergence zone over the western Pacific during the Little Ice Age ’ indicates that both the East Asia Summer Monsoon and the Northern Australia Summer Monsoon retreated synchronously during the recent cold Little Ice Age in response to external forcings such as solar irradiance variation and possibly large volcanic eruptions. … hydrological records from the Asia-Australia summer monsoon area, analysed by Professor Hong Yan and his coauthors, show that southward migration of the ITCZ did not occur during the cold Little Ice Age. Instead, the hydrological data support the operation of a new dynamic mechanism named ‘ITCZ/Rainbelt contraction’ in the Western Pacific region during the Little Ice Age. Prima facie, a southward migration of the ITCZ should result in less precipitation in the East Asia Summer Monsoon area but more rainfall in Australia Summer Monsoon area. In contrast, the Synthesis of a large set of palaeoclimatological records from across the monsoonal area establishes that the precipitation in both continental East Asia and northern Australia decreased synchronously during the Little Ice Age. The unusual spatial variation in paleoclimate records therefore documents a distinctly different rainfall pattern that violates the former expectation of ITCZ southward migration. Furthermore, comparison of these results with solar records indicates that a relationship exists between the rainfall changes and Total Solar Insolation…..
To explain these changes, the scientists propose an alternative dynamic scenario which they have tested using process-based climate modeling. Rather than strict north-south migration, the multi-decadal to centennial change for the western Pacific Intertropical Convergence Zone can excitingly be shown to have contracted or expanded in parallel with solar irradiance variations. This new understanding clearly adds to the richness of mechanisms by which the Earth climate system can vary naturally and significantly over periods between a few decades and up to a century in length.…. [Paper] by Hong Yan of the Institute of Earth Environment, Chinese Academy of Sciences and an international team of co-authors from the Alfred Wegener Institute (Wei Wei), Harvard-Smithsonian Center for Astrophysics (Willie Soon), Institute of Earth Environment (Zhisheng An, Weijian Zhou and Yuhong Wang), University of Hong Kong (Zhonghui Liu) and Institute of Public Affairs (Robert M. Carter). This man was down right DANGEROUS TO THE CAUSE and at a critical time. With the critical Paris Confab in view he had to be discredited. So for this work and other as a part of TEAMS, Willie Soon was attacked. Of course Soon was already a major target because of the 2003 Soon and Balunias paper that disagreed with the Mann, Bradley and Hughes Hokey Stick. **The paper came to the notice of President Bush and Kyoto was not signed by Bush. These are just three of the scientists that have been attacked by the media or had their funding cut off or have been fired. There have been many many more. That is why this is ALL ABOUT POLITICS and not science. <b.Worse it is the custom and practice of the IPCC for all of its Reports to be amended to agree with the political summaries. The facts are as follows. You are correct Eliza, except for trying to use the cartoonist site — SS (given Cook’s Nazi uniform we should no longer use SkS) and a bit of the highly political IPCC reports, he is incapable of posting anything to do with climate much less science. I really don’t think he has EVER read a scientific paper from start to finish. That makes him the Duck in a shooting gallery. IT PLAINLY PROJECTS A DECREASE IN SNOW COVER EXTENT. 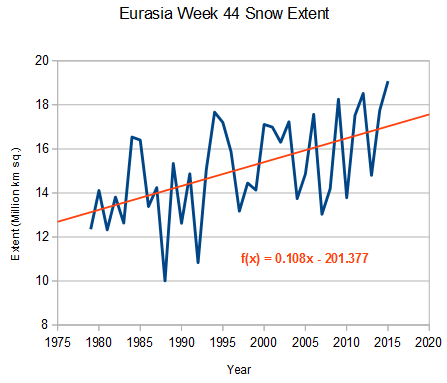 Tony is posting graphs showing increasing snow cover extent. Your own source says you’re wrong. More telling is that you quoted the specific sections proving you’re wrong, in an attempt to defend your stance. That proves you don’t understand the argument. No one in this post has mentioned snowfall volume, except you. You’re arguing a point that’s not in contention, while supporting Tony’s thesis with your own cites. Do you know the difference between snowfall extent, and snowfall volume? And the supposed software engineer/technical writer can’t even post it in the correct readable form. Thanks for actually going to the effort to read that mess. I’m just wondering if Martin read it. And if he did, did he understand it? I keep trying to find someone on his side who’s both willing to discuss the subject, and who can make an argument more substantive than appeal to authority. For 15 years now, I’ve been told the debate is over. Can someone at least point me toward some kind of record of that debate, whenever it was? I have an open mind. I want to read the actual evidence, not the political spin. And I’m willing to admit that the end is nigh, if that’s where the evidence leads. But I can’t have a meaningful discussion with someone who doesn’t understand his own arguments. ” The debate is over” is a shut-up. The IPCC was formed to find the evidence needed to convince people there was a problem so they would agree to hand over their wealth and their freedom. There never was a real debate because there never was a real problem and they KNEW IT. That is why no matter how much evidence is thrown at CAGW it never goes away. It is a very useful political hobgoblin and not science. No and no. Of course not, he doesn’t need to do either. Martin is not here to add to the debate, here is here to obfuscate and derail it by falsely countering any and every scientifically correct post. Check out the work of Saul Alinsky’s ‘Rules for Radicals’, Martin epitomises it perfectly. Once again a perfect description of Martin and his tactics. OH, that was a wonderful read and an excellent analysis of Trollish behavior. Well, I don’t blame a warmunist troll for not liking it. They all hate the Viner reference. I mean, wait, what reference? But we are now used to the shiftiness and rewriting of history so much critical history is screenshot and saved.